Computer and Laptop Repair. Security camera installation. I work with Dell, HP, Toshiba, Sony, Panasonic, Apex, Cisco, Microsoft and Asus. I was in the military for 7 years and traveled to over 8 different countries in that time. I have 4 great kids and I love to cook. Are you reliable and do you how much experience do you have. I went to a client's office that had been having problems getting a computer connected to the internet. He had had several technicians come out and they would give him crazy stories and never got the problem fixed. I went there fixed the problem and he was very happy. He has been a good client of mine every since. If you're looking to save money, I recommend you hire me!! I'm very affordable and I don't try to charge a arm and a leg for my work like these other places. I also recommend you shop around for deals on the parts and other things that you are looking for. Another thing is to be sure to have maintenance done on your computers at least once a quarter to keep check on hardware and other issues that can occur with your pc. Will save you a lot of money in the end. I used to work on computers on the side all the time for family, friends and coworkers. My wife saw me with about 3 or 4 computers and said "You know you should be getting paid for this" I said you're right and started the business. I provide maintenance services to help keep their computers running smoothly and avoid any hardware breakdowns. The most common type of jobs that I've been seeing is screen replacement on laptops. People drop their laptops or get them damage all the time and that's why I'm here to help get them repaired professionally and in a timely manner, not to mention at an affordable price. I recommend having all the information ready about what you are needing done. Or if you're looking to compare prices, be sure to have the other companies price written down so you can at least have a idea of what you are looking at for repair. That way you can compare each provider. Do you fix or remove virus'? Of course, I laugh inside because I repair computers, so that's a given. I respond with yes, I remove virus'. It's just funny but I don't mind. Another question is can I fix a cracked screen on phones or ipads? I don't do that right now, but I can refer you to someone. I do plan on doing that type of work in the future though. That it's challenging, exciting and interesting. Working on computers and different technical problems is a great challenge for me. I love what I do and I get satisfaction out of making my customers happy. Don't be afraid of computers, they're your friend! I average about 2 projects a year, I'm hoping that will increase. Fixr has validated the email provided by Ty The Computer Guy, LLC. Fixr has reviewed the content provided by Ty The Computer Guy, LLC to match our community guidelines. 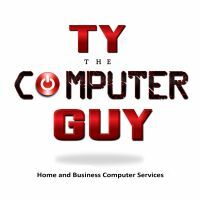 Ty The Computer Guy, LLC has been rated with 40 experience points based on Fixr's rating system.